Here are some pictures of color-altered wood (also known as discolored wood), altered as a result of a wound or an injury. 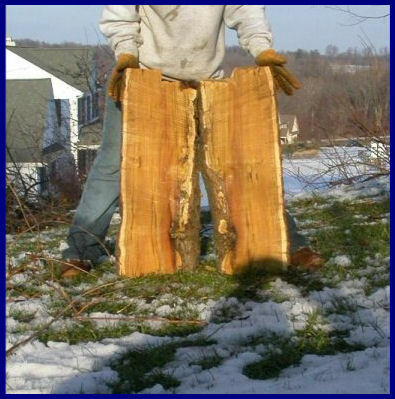 True heartwood gets its color from an aging process and not a wound. You can have color altered wood within heartwood as a result of a wound or an injury after heartwood has formed in heartwood forming trees. It would be the first to decay. Color altered / Discolored wood is a PROTECTION WOOD. The wood has been altered to a higher level of protection. (Left) The only way we will understand many of the unique features of trees is by doing dissections in a longitudinal plane (Mulberry). Mulberry is a heartwood forming tree. You can see its width is consistent with a very thin strip of sapwood. This is not seen when trees are examined only in the cross section. If you look close you can see the color altered wood associated with the wound at the bottom inside of the samples. This wood is mostly static mass.